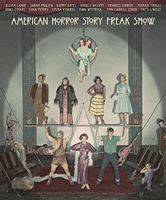 AHS: Freak Show (Season 4) | FABULOUS-EMMA.COM - The original source for EMMA ROBERTS! Begins its tale in the sleepy hamlet of Jupiter, Florida in 1952. A troupe of curiosities has arrived, coinciding with the emergence of a dark entity that threatens the lives of townsfolk and freaks alike. This is the story of the performers and their desperate journey of survival amidst the dying world of the American carny experience.